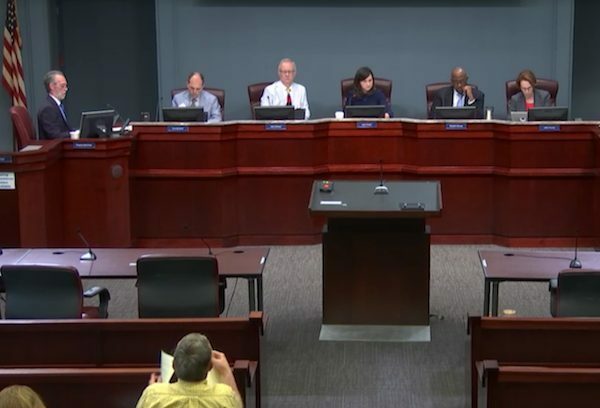 Arlington leaders now say they’re ready to start studying unpleasant budget measures from tax increases to staff layoffs, as they gear up to confront next year’s hefty budget gap. The County Board is set to sign off today (Tuesday) on new budget guidance for County Manager Mark Schwartz, as he gets to work on a new spending plan for fiscal year 2020. The memo directs Schwartz to develop a range of possible options for the Board to evaluate next year, including “a range of potential tax increases” and “proposals for program and personnel reductions or eliminations” if Schwartz can’t develop a balanced budget while relying on the existing tax rates. The Board made a handful of spending cuts in the budget for fiscal year 2019, but opted not to raise any of the county’s tax rates. Since then, Schwartz has frequently called for the Board to give him the flexibility to pursue such budget measures, given the county’s gloomy near-term financial prospects. Though Amazon’s arrival in Arlington could well pour millions in new revenue into county coffers, officials project that their budget challenges won’t vanish overnight. In all, the county’s combined budget deficit could be as large as $78 million next year. All on its own, Schwartz expects that the county will need to close a gap of anywhere from $20 million to $35 million, a gap driven by factors including Metro’s increasing expenses, the new raises for public safety workers the Board approved in the 2019 budget and new spending associated with the statewide Medicaid expansion. But the county school system could tack on another $43 million in unmet needs, as it works feverishly to build new schools and keep pace with the county’s influx of new students. Without any tax rate hikes, staff currently projects that the county will be able to send about $7.7 million to Arlington Public Schools than it did last year. But that increase, driven by rising real estate assessments, likely won’t be enough to solve all of the school system’s funding woes — the School Board only narrowly avoided class size increases last year, and will face similar challenges this time around. The Board’s budget guidance does identify one program that it hopes Schwartz will be able to protect from budget cuts: the Affordable Housing Investment Fund, a loan program designed to incentivize the construction of reasonably priced homes. The memo to the manager suggests that Schwartz craft a proposal to maintain the $14.3 million in funding the Board sent to the fund last year, and recommends making more of the funding “ongoing” rather than subject to the Board’s appropriation process each year. The latter change was one championed by Board member John Vihstadt in his losing bid for re-election this year, and the entire Board has emphasized the importance of funding affordable housing programs to prepare for Amazon’s projected impacts on the housing market. As part of its deal to land the tech giant, the county even committed to directing about a third of the money it spends on affordable housing each year to specifically serve the areas around Amazon’s new headquarters in Crystal City and Pentagon City. The Board is set to vote to approve the new budget guidance today, setting the stage for Schwartz to deliver his proposal to the Board in February. The County Board and School Board are also set to hold a joint work session next Tuesday (Dec. 4) to kick off their initial budget deliberations. Ask Eli: Why Is My Neighbor Mowing My Lawn?